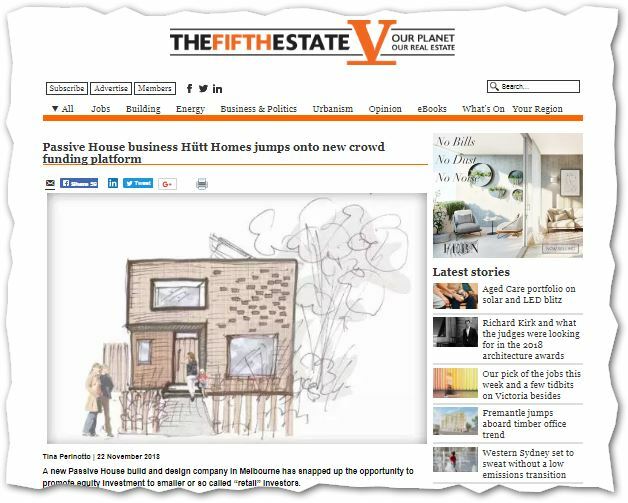 22 November 2018 The Fifth Estate’s Tina Perinotto: Passive House business Hütt Homes jumps onto new crowd funding platform | Sustainable Engineering Ltd.
Hütt Homes has made news in Australia by seeking crowdfunding for its passive house design business. This crowdfunding is an equity investment allowed by the new recent changes in Australians law. This will be the first crowdfunding product in the sustainability area. Hütt Homes have plans for a beautiful show home lined up to demonstrate the feel of passive house and the benefits of living in a passive house to their prospective clients. Their primary focus is on high indoor air quality which is enabled by the passive house standard ventilation systems.